So, this is one of those meals that seems easy to me, but even I don't think about making it very often. My husband requested "chili size" tonight, so he got a hamburger with chili all over it, and I had a baked potato with cheese and chili all over it. The kids had other variations of the same. I love this because I always have leftovers, and it's something I can look forward to eating for lunch at work the next day. Usually I burn my tongue, but it's worth it. It's kind of like eating chili cheese fries, without the frying. You can add whatever other toppings to this that you like. The sour cream in the picture was scraped off right after I took the picture because I'm not a fan of sour cream on my food. In my food is one thing, but on my food is quite another. I can't explain it; I just accept it because it saves a few calories in an already fattening dinner. You can use your favorite chili recipe for this, which might even involve opening a can. I like to use Williams Original Chili Mix because it calls for two pounds of ground beef, it has no added salt, and it tastes really, really good. I add 3-4 tablespoons of masa (corn) flour as well, to add some body to the chili. You can use wheat flour as well, but the corn flour just seems to go better with chili in my opinion. I use the one can of diced tomato option and I add a can of water and two beef bullion cubes for the salt. Scrub and rinse potatoes. Pierce each potato 6-8 times, and trim off flawed spots and eyes. You have two options at this point. First, bake potatoes at 400 degrees for about an hour, until they give when squeezed with an oven-mitted hand. 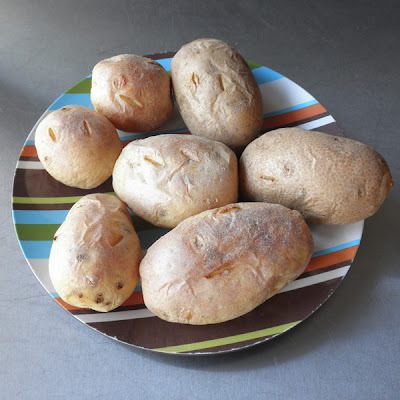 Second option is to place potatoes on a microwavable dish and microwave for 5 minutes before baking for about 30 minutes or until they give when squeezed with an oven-mitted hand. 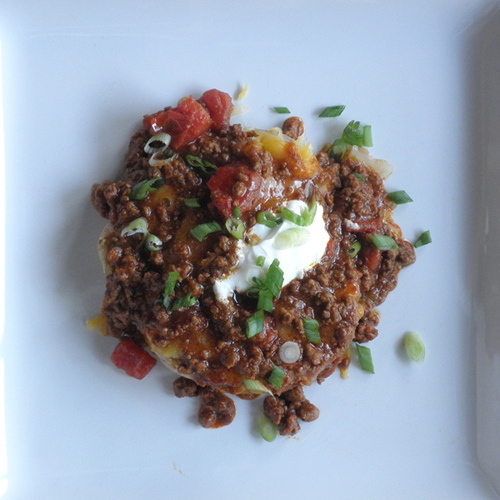 While potatoes bake, prepare chili and make sure it's hot. When potatoes are done, carefully squeeze to break up potato's interior. Cut in half and place open faced on serving plate. Spread a tablespoon or so of butter on potato, put about 1/4 cup or more cheddar cheese all over the surface of the potato. 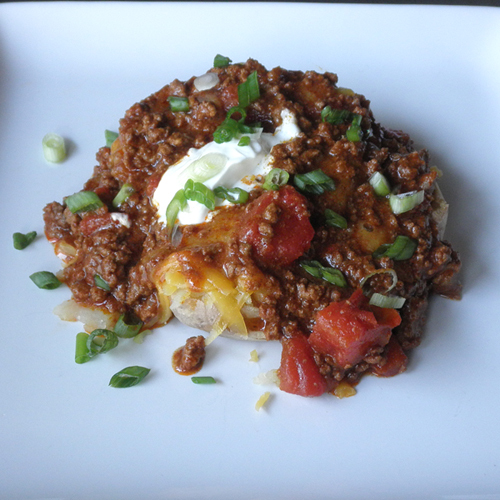 Spoon 3/4 to 1 cup of hot chili over the cheese and top with green onions and sour cream, if desired. Serve with fork and knife because you'll want to eat the WHOLE thing. I should have made a few more small potatoes. Here I have two russet potatoes and four golden potatoes. To my knowledge I no one has had problems with my "print friendly" button. If I have any, I will let you know! Thanks!